Future Focus-Relating to God As We Approach the End Times by Christian author Larry Adams presents to readers a thought provoking book on how one views God and interprets scripture. Inspiring and encouraging, the author asks if you are seeking God first in your life. The book also speaks of our own assumptions, and assumptions that relate to God as well. By use of specific reading fundamentals that have been in use for centuries and rules of interpretation, the author is careful and diligent to interpret scripture, not adding any of his own assumptions or interpretations. The book challenges readers to examine their walk with God and to come into a place of maturity by going back to the basics. The basics are presented in his book and are taken from scripture. Presenting an overview of each subject, chapters are short and sweet and include scripture that instruct, inspire and encourage believers and non-believers alike to make God their focus and priority in life. The theme of the book is to put God first in all you do and toss out all assumptions that are just that…assumptions. Assumptions are what we live and accept from those around us and in our world. Assumptions are influenced by many different factors. The author encourages believers to read from the Bible and to take to heart the many warnings and teachings that the Bible has to offer. Although some of his writing may be considered confrontational or controversial, the author notes that Jesus was accused of much of the same from the religious of His day as well. An overview of many pertinent topics are included that interest many. These chapters include titles such as: After God's Own Heart; Being in God's Presence; Burden Bearing; Curses; Disciple's Oath; Do You Really Mean It; Enforcing the "Santa Claus" principle; Evil and Suffering; Free; Give Thanks; Heavenly Minded to be Earthly Good; Herd Mentality; Knowing Jesus; Mommy's Dying from Cancer; Practicing Lawlessness; Reading Fundamentals- Context; Remain; Repent and Believe; Responsibility to Maturity and Obedience; The Cause of Christ; The Oldest Trick in the Book; Rapture Notes and Revelation. All these chapters are very informative endeavors to shed light on subjects that are relevant to repentance, faith, obedience that reveal the truth of God's Word and point the reader to keep God as their main focus for the future. A highly recommend and short read that will give insight and assist readers to better understand the basics of scripture and reading fundamentals. Visit The Home of Author Larry Adams for more information. 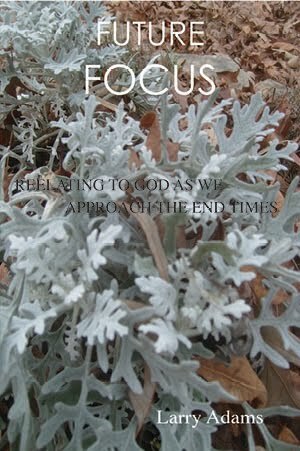 You may also get your copy of Future Focus: Relating to God As We Approach the End Times by Author Larry Adams on Amazon or at Larry Adam's Barnes and Noble page.